A rendering photo of the Japanese space probe Hayabusa which collects surface samples of the asteroid Itokawa. Australian Aborigines will be among the first to view the space probe after it crashes to Earth in the outback this weekend, to ensure it does not affect sacred sites, officials said. In a nod from the space age to an ancient era, traditional Aboriginal land owners will travel with Japanese, Australian and US officials to view the asteroid-chasing Hayabusa capsule after it lands in South Australia early on Monday. "Indigenous people will accompany the retrieval team in a helicopter to conduct an aerial view of the landing site... to ensure that no inadvertent damage is caused during the ground retrieval process," a spokeswoman for the Australian Defence Force told AFP. Scientists hope the Japanese craft -- which has been hit by technical delays -- has managed to gather the first ever fragments from a moving asteroid, material which could reveal vital clues about the Universe. The Hayabusa will flash over the Australian desert, lighting up brighter than Venus as it breaks up and incinerates as it returns to Earth, after releasing a canister containing the hoped-for samples. It is due to touch down in the remote Woomera Prohibited Area (WPA), a 127,000 square kilometre (12.7 million hectare) military zone in the state of South Australia which is home to some sacred indigenous sites. The defence department said it was "highly unlikely" the 18-kilogram (40-pound) basketball sized probe, which has completed a seven-year, five-billion-kilometre (three-billion-mile) journey, will hit a sensitive area. "However, every reasonable step will be taken by the ground retrieval party to avoid driving over sacred sites," defence spokeswoman Flight Lieutenant Melody Earl said. The Japan space agency JAXA's Hayabusa ("peregrine falcon") is expected to be the first space mission to have made physical contact with an asteroid and returned to Earth, although it is not known how much material it has retrieved. 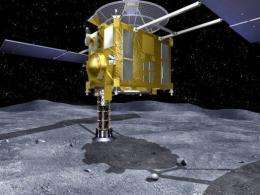 The Hayabusa space mission for Itokawa, an asteroid 300 million kilometres from Earth, began in May 2003 and two years later it became the first spacecraft to land on and lift off a celestial body other than the moon. JAXA has said Hayabusa's on-board devices indicate Itokawa's parent body was formed in the solar system's embryonic stages. "It's a primitive celestial body that contains elements of an ancient era,' JAXA said. "It was born between several tens of millions and hundreds of millions of years ago." Australian Aborigines are believed to be the custodians of the oldest continuous culture on the planet, with a history which stretches back more than 40,000 years.